The newly sworn-in National Chairman of the Peoples Democratic Party, Mr Uche Secondus, has started his time as the leader of the opposition party by attacking the All Progressive Congress, especially the foundation on which it was built. Mr Secondus, who was declared the winner of the PDP’s chairmanship election at about 3:30 am on Sunday morning and sworn in shortly after, used his acceptance speech to verbally serve the APC a ‘quit notice’, vowing to lead his party back to power in 2019. “Let me assure you great members and leaders of our party, that by the grace of God and with all hands on deck, the brief tenancy of the All Progressives Congress (APC) in Aso Rock Villa expires on May 28, 2019. By this, we serve them a quit notice,” he said. In launching his attack on the APC, the new PDP chairman turned to a quote by Dwight Eisenhower. He said, “In the words of the 34th President of the United States of America Dwight Eisenhower, ‘If a political party does not have its foundation in the determination to advance a cause that is right and that is moral, then it is not a political party; it is merely a conspiracy to seize power’. After taking his shot at the APC’s foundation, the PDP National Chairman argued that his party was founded on ideals that are “totally in tandem” with those of Nigeria’s founding fathers. “Those founding fathers had in mind, a prosperous and lasting democracy as captured in the preamble of our constitution, clearly stating their desire for a free and egalitarian society,” he said. Although the PDP was swept out of power at the Federal level by the APC in 2015 after a 16-year rule, Mr Secondus is proud of its performance. “I can, therefore, say without an iota of doubt that PDP’s contributions to the growth and sustenance of democracy in this country in the last 18 years remain unequalled,” he said. 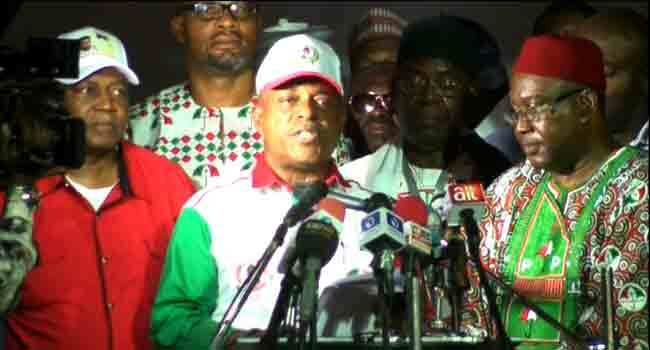 Despite defending the PDP’s performance, Mr Secondus admitted that it was not above mistakes. And as he starts his mandate with the promise of leading the party back to power in 2019, he plans to achieve the objective by learning from the past. “With your mandate, I assure you that all necessary steps will be taken to avoid a repeat of our past mistakes. Indeed, we have learnt our lessons and by this convention, we are now set to forge a new path for our great party and Nigeria,” he said. Away from the attacks and promises, the new PDP leader paid tribute to one of the founding fathers of the party, Nigeria’s first Vice President Dr Alex Ekwueme who died on November 19 at a London hospital aged 85. He also welcomed back to the PDP a former Vice President Atiku Abubakar, who dumped the APC on November 24 and returned to the PDP nine days later, on December 3. Secondus also praised Adeniran and Dokpesi who contested against him for the national chairmanship seat, describing them as eminently qualified to lead the party for the role and thanking them for a “worthy contest”. “You have every cause to stand tall and I now extend my hand of fellowship to you all. Let ‘Us’ rebuild, reposition and regain,” he said. Adeniran and Dokpesi may not be so quick to extend a hand in return as both have criticised the electoral process, and expressed anger at the emergence of a ‘Unity List’ at the convention which purportedly contained a list of ‘unity candidates’. The list, allegedly compiled by governors in the party, had Secondus’s name on it as the ‘unity candidate’. Adeniran cited it as one of the reasons behind his decision to walk out of the convention ahead of the announcement of results, saying it was used to rig the election. Beyond walking out of the convention, Adeniran has called for its cancellation.